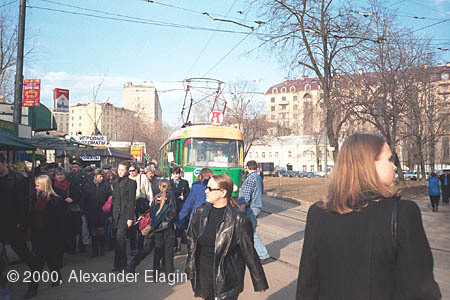 A stretch of a tram line from Novokuznetskaya Street to Komissariatskiy Bridge is relatively young. 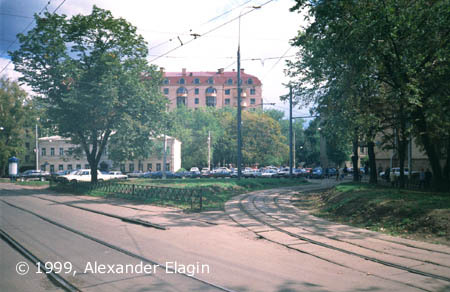 It was constructed in 1963 as a replacement for a line in Pyatnitskaya Street and Osipenko (now Sadovnicheskaya) Street that was closed that year. It is interesting to note that this short line was the first to be constructed in the central Moscow since 1930s - and the last at the same time. No new tram construction or relocation was conducted in the heart of the city since this line started operation. Sadovnicheskaya Ulitsa stop is situated not far from Komissariatskiy Bridge across the arm of Moskva River. The photo features the one and only tram of model 71-621 (factory number #000001). This prototype vehicle still operates, while no more ones of this type have been built. 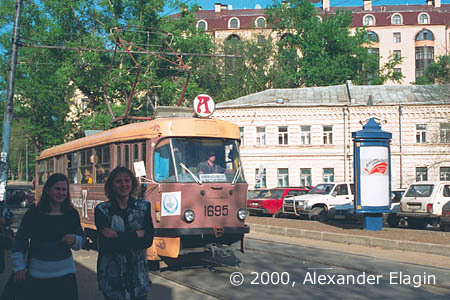 It resembles another type of Moscow trams - model 71-619, or KTM-19, but has slightly modified body. 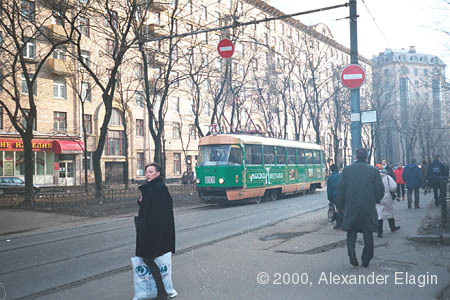 Sadovnicheskiy Proyezd came into being almost simultaneously with the tram line, and new (then) buildings replaced the original development. The road was initially planned to become a southern part of the Boulevard ring, but this project was never completed. This photo shows the Annushka moving from the boulevards towards Novokuznetskaya. A typical rush-hour view of a tram stop at Novokuznetskaya metro station. 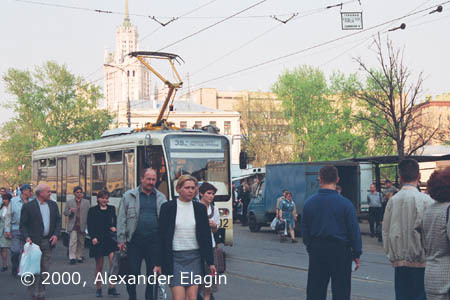 In 1999 Bolshoy Ustyinskiy Bridge was closed for reconstruction, and tram operation on the Boulevard line was ceased. 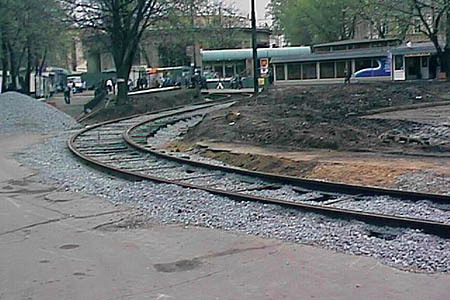 A provisional reversing loop was built beside Novokuznetskaya metro station. The photo kindly presented by Nick Vince displays the construction works on this loop. This photo also shows the provisional loop turning right, and the cut-off line towards the bridges can be seen in the left. Later that year the reconstruction was over and the tram operation was restored, while the loop would soon disappear to be replaced with a parking lot.